Mad Max lead us to believe that if our seas and oceans dried up, whoever possesses the largest petrol supply would hold the most power. 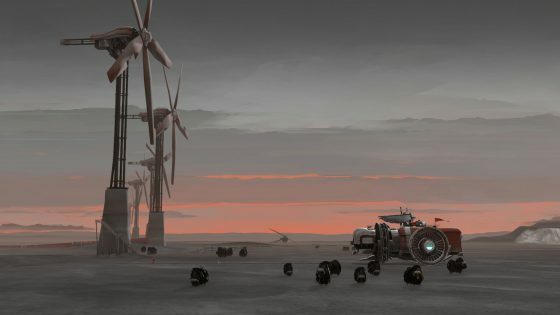 FAR: Lone Sails shares the theme of a post-apocalyptic world with dried-out seabeds, only here the survivor’s vehicles are equipped with engines that can turn any solid matter into hydro energy. Wooden boxes, bundles of books, and even explosive barrels – shove it in the compressor and you’re good for another few miles on the clock. FAR: Lone Sails simply requests you come along for the ride. 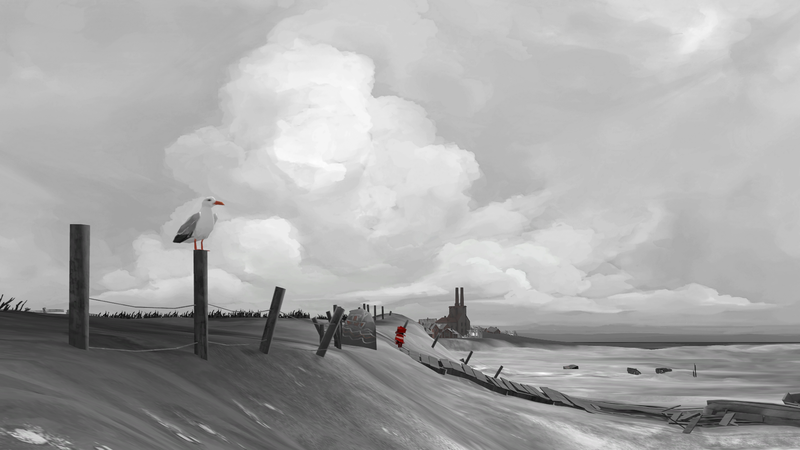 The destination remains a mystery throughout; it’s just you – a nameless young girl in a breezy red dress – exploring a desolate wasteland in a rickety vessel. It’s a game full of intrigue, as you trundle across a mixture of terrain never knowing what lies ahead. The pace is slow, and there’s no story to take in. Instead, some light environmental storytelling fills in the blanks. Piloting the vehicle is a demanding experience. It’s a colossal motorhome of sorts, filled with glowing red buttons to push (and headbutt). As it slowly traverses the landscape the engine must be stoked, sails raised, steam vented, and the brakes applied in a timely fashion. The engine will catch fire if too much damage occurs, requiring you to grab a hose and consume valuable hydro reserves to tackle the blaze. Damaged equipment must also be repaired via the welding tool. The only means of failure is from neglecting fires for so long that the vehicle eventually explodes, sending you back to the last checkpoint. Mother nature is your one and only enemy here. Over the course of the experience, you’ll face high winds, heavy rain, lightning, and a few other surprises that we won’t spoil. Often during these instances, you’re forced to juggle a few things at once, piling on the pressure as you try and escape storms while topping up fuel reserves, putting out fires, and keeping an eye on the path ahead. Often the path ahead will be blocked by a gate or similar, requiring you to leave the vehicle and solve a puzzle or find a workaround. Puzzles are mostly of the physics-based variety, similar to those found in LIMBO or Inside, with the most demanding set inside a disused mine with movable minecarts. 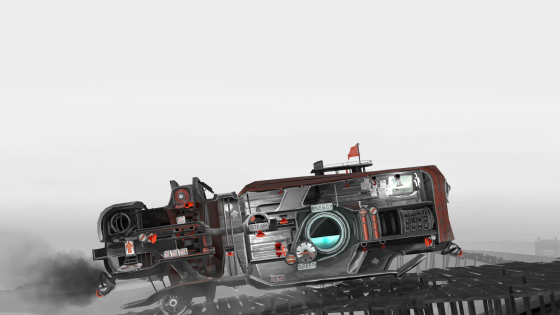 Ingeniously, the vehicle is tied into puzzle solving as it’s equipped with a winch and a few other items that can be used externally. In a few instances, brute force is also needed, smashing through barriers at full pelt. If in doubt, give it a clout. Some pitstops feature new upgrades, often requiring manoeuvring the vehicle into the correct position so new tech can be fastened. The most helpful of these is a vacuum that’ll inhale the consumables used to stoke the engine. We love the fact some items are a little too nice to recycle, prompting us to deliberate what to incinerate next. Thankfully, the fancier items – trinkets, if you will – can be used as decorations. You can even burn the radio if it’s random warbling starts to grate. Speaking of which, the sound design is nothing short of superb, heightening the atmosphere no end. The bellowing wind, the flapping sails, the sound of hail hammering a metal roof, and the thunderous roar of the engine all help to make this experience a memorable one. Visually, it’s slick too, featuring backdrops reminiscent of watercolour paintings, and bright colours used sparingly. When the rickety vehicle trundled to its destination, several puzzles and more than a few natural disasters later, we wished our journey hadn’t come to an end quite so suddenly. Two hours of play (slightly longer if you sightsee, or if the puzzles leave you flummoxed), and a few missable achievements/trophies is about all FAR: Lone Sails has to offer. It certainly doesn’t overstay its welcome. Quite the opposite, in fact. But maybe we’re missing the point. Like an inspirational poster once told us: life is not about the destination – it’s about the journey. When the wind is in your sails and the engine is roaring, hurtling you towards the great unknown, there’s nothing else quite like this.